On Tuesday, November 13th, the WCCD President and CEO, Dr. Patricia McCarney, officially presented the Mayor of Welland, Ontario – Frank Campion – with WCCD ISO 37120 Platinum Certification. The City of Welland reported 95 out of the 100 ISO 37120 indicators. The WCCD is the global leader in standardised city data that helps to create smart, sustainable, resilient and prosperous cities. Welland’s membership in the WCCD gives the City the opportunity to compare best practices with other cities and actively participate in a worldwide organisation that uses standardised metrics to find innovative solutions to shared challenges. 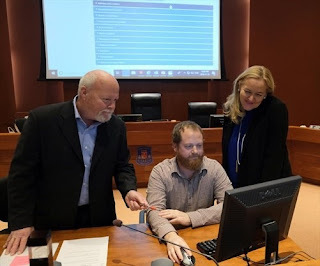 Welland’s ISO 37120 data is now viewable on the WCCD Open City Data Portal (accessible through www.dataforcities.org) which allows for local, national and international comparisons. The WCCD ISO 37120 certification comprises 100 indicators around 17 themes on city sustainability and quality of life. Cities are certified based on the recommendation of an independent third-party verifier who reviews the city data; ensuring conformity with the definition and methodologies of ISO 37120. Welland is the tenth city to receive ISO 37120 certification in Canada, joining the WCCD global network.